Full Results | Photos by RunningWorksPics Uploading! Kevin Antczak of Mainland Regional ran a 22 second PR and secured his first cross country win on Saturday leading the South Jersey Open merge at 16:00. 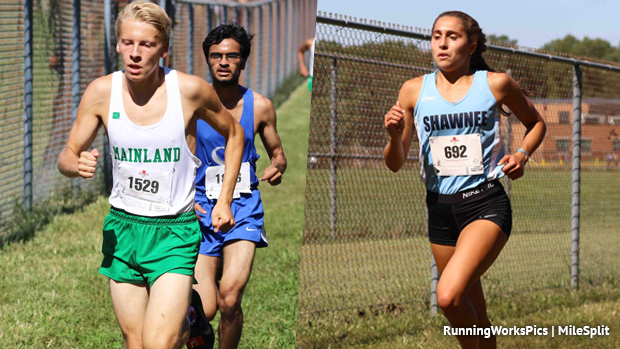 Shawnee senior Isabella Turner continued her trend to dominate races winning her race by 48 seconds at 18:03. Turner's 18:03 is the sixth fastest time recorded over the past four years at Delsea and the performances ahead of her came during later season sectional wins by the likes Alyssa Aldridge, Briana Gess, and Niamh Hayes. Turner is ready for a big year to say the least, she is over a minute faster than her 2017 performance at this meet. Her leading performance helped her Shawnee squad to a fourth place finish in their division and merge. Katy Storti won the Division 1 girls race with a time of 18:58, the third fastest on the day, and led her Bishop Eustace Prep team to the division win as well. Division 2 went to Mainland Regional's Alyssa Turner running 19:52, and the team battle went to Paul VI with 33 points. Paul VI came out fifth in the overall merge. The best girls team performance of the day however belonged to Cherry Hill East who won the Division 1 race and led the merge with 97 points, average of 20:37, and split of 1:37. The number one scorer was Sarah Pierce with the fifth fastest run of the meet at 19:30. A shout out to Kate Rathman of Cherokee, 18:51, and Angela Bannan of Holy Spirit, 19:28, with the second and fourth fastest times in the merge. On the boys side, as already mentioned, Kevin Antczak led the meet running a 22 second personal course best of 16:00. The junior sparked a brilliant meet by his Mainland Regional squad who took the merge with 52 points averaging 16:31 and splitting just over a minute between their top five. Their Division 2 victory showed a scoring line of 1+3+4+7+12 for 27 points. Also out of that Division 2 race was senior Manas Gupta of Sterling running 16:17, the second fastest time of the meet. Connor Melko won Division 1 running 16:23, leading his Bishop Eustace squad to victory with 61 points. That makes a clean sweep for Division 1 by Bishop Eustace boys and girls. Melko ranks third overall for the meet merge. The Division 3 win went to the fourth fastest runner of the day Oliver Adler at 16:23. His team also got the job done winning the race with 38 points, fitting three in the top four finishers! Cherry Hill East only behind Mainland Regional in the merge scoring 98 points, averaging 16:53, and splitting an impressive 48 seconds.